Boasting with long white sandy beaches on each side of the island, crystal-clear waters, and beautiful turquoise-blue lagoon, Hideaway Beach offers guests the luxury of space and privacy across 297,000 square metres. With some of the largest villas in the country, as well as new 50 water villas over the sparkling lagoon, all 103 luxury villas and residences fall into ten categories ranging from beachfront to over-water. Each villa is carefully positioned to offer peace, comfort and privacy to guests. To ensure the absolute absence of stress during your holiday, each of the villas is assigned a butler, to deal with anything from unpacking luggage to food, activity and transfers. Home to the first fully-functional marina in the Maldives, due to its unique reef system, Hideaway Beach Resort and Spa is surrounded by an enviable dive and snorkelling spots close by. The resort offers an extensive programme of wellness, kids club and sporting experiences, vast dining options, and one of the largest spas in the Maldives. 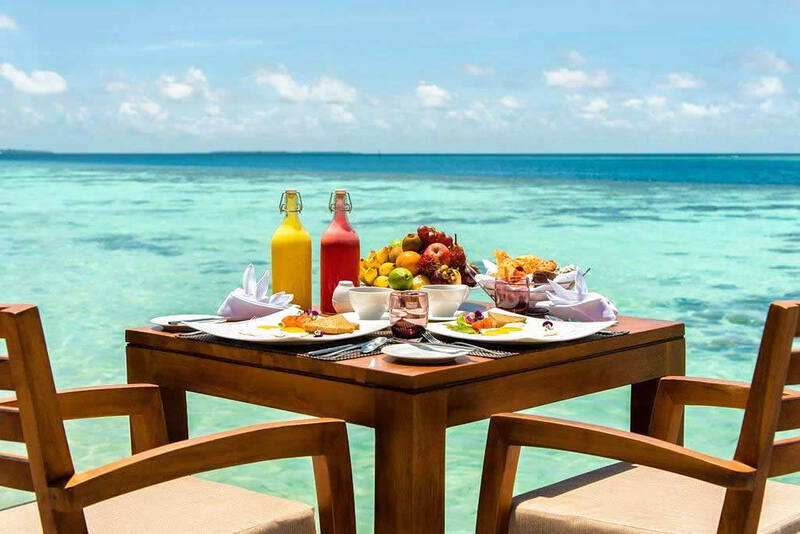 Suitable for both couples and families alike, the five-star resort resort is accessible by a 50-minute domestic flight followed by a 15-minute speedboat ride, or 65-minutes exclusive seaplane jorney from Malé airport. From the first contact the resort's transfer reservation, right until you check-out, every part of the resort experience is truly delightful. Despite a long trip, getting there is pretty easy and full of small but nice surprises. After landing and collecting your luggage at Malé International Airport you will be greeted by the hotel's representative for checked in to the Maldivian Air domestic flight to Hanimaadhoo, and will guide to the VIP lounge. If you have time you can check the airport's Dhiraagu mobile shop to buy local SIM card, but we have to tell that is WI-FI quality is superb on the island. The VIP lounge offers soft drinks and snacks for free, and the staff notifies you personally when your flight is ready for boarding, no need to worry about the flight schedule display - it will be far from accurate anyway, just relax, you are on holiday. After an approximately 40 minutes flight to Hanimaadhoo International Airport, Hideaway's staff will already waiting for you for the 20-min speedboat trip to the island. The crew offer refreshers, cooled and scented wet towels and fruits - very welcome after so much travelling. Upon arrival to the Hideaway Beach Resort jetty expect warm welcomed by your butler and a team of drummers with a refreshing towels and necklace made of fresh flowers. Check-in is an air conditioned section of the reception area. You'll received a map of the island, a detailed explanation of how things work in the resort, followed by a short buggy ride to your villa. To get to the resort is a long, exhausting jorney but it is absolutely worth it! Measured 1.4 km in length x 500 m in width, the immaculately maintained island, as beautiful and stunning as you can imagine. The resort is very clean, well designed and maintained. The island's interior has amazing vegetation, looks like a tropical jungle. This also means there life within it, and yes there are mosquitos as well. They are annoying only at twilight hours, and are rarefied with a thick and stinky fumigation's smoke every week. Absolutely acceptable trade-off. Water, beaches and corals are just stunning. The villas on the island are spaced so that you really have your privacy and the landscaping is well thought out to add to this. The rooms are beautifully designed, both the interiors and the outside space are fulfill the highest expectations. Waking up in the morning with a view of the palms and crystal blue water, taking a swim on you private beach, whole family playing in the sand and the pool are all unforgettable experiences. You can swim in a wide turquoise lagoon with white and fine sand at the north point of the island, while the house reef is only about 10 meters away from the beach at Meeru bar. You can spot eagle rays, turtles, baby sharks and so many beautiful fishes while snorkelling, just a few meters away from the shore. West side houses have the afternoon sun and sunset views, east side a bit more privacy on the beach. In short: there's no "good" and "bad" choice or placement, all of them are great. Also, with every accommodation you get 2 bicycles which are very useful to access the big island. Your kids will given a little fish back pack and a mini push bike too ... cycling around the resort is a great experience. All guests also have access to buggies cervice at any time. The best part are the people working there. Amazing staff who are on their toes from the moment you step on the island to the moment you leave. Always there at the right time, checking up on you, if you need anything, making reservations and suggestions, even taking care of kids while you eat. This is more than 5 stars service. The butlers are so attentive, nice, and genuinely concerned for us during our stay. These people really make the world of difference in your trip and though if you've not been to any other Maldivian island, we would argue it would be extremely difficult to do better in terms of service and staff than Hideaway Resort. The level of personal care and true friendliness is unmatched, high benchmark for any place you’ve been to. Big compliments to the management team, bringing the customer experience to the next level and always interested in what can be improved. 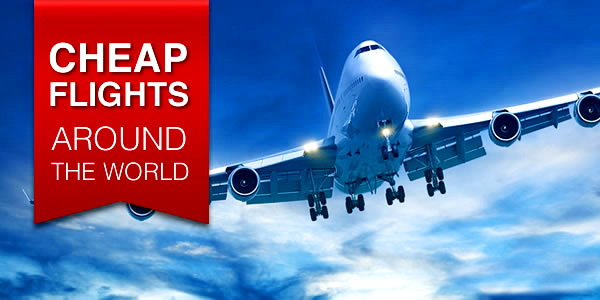 The guests are a mix of ages and nationalities, some honeymooners, some families and the people you can see are mostly from the Europe, Russia, America and Asia. High speed Wifi is available in the villa as well as the main areas. 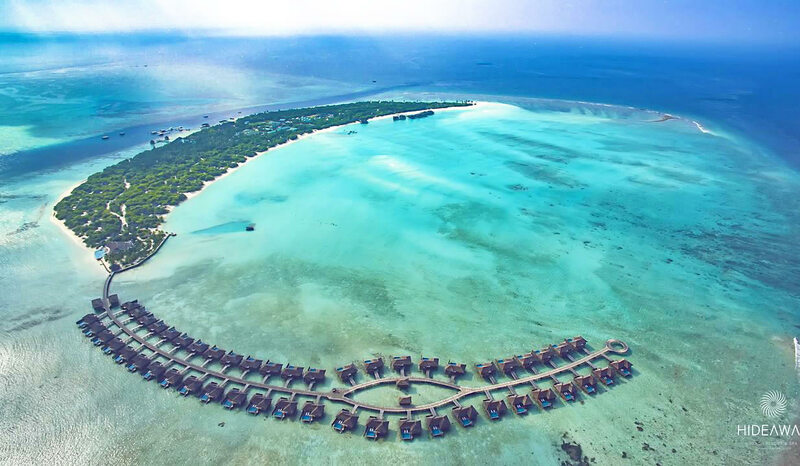 The Hideaway Beach Resort & Spa in Dhonakulhi Island is located in the Haa-Alifu Atoll, North Maldives, approximately 290 kilometres from Malé, the capital city of the Maldives. A 45-minute scenic flight from Velana International Airport (VIA) lands at Hanimaadhoo International Airport, and it is followed by a short 20-minute speedboat ride to Dhonakulhi Island. Alternatively, guests arriving with their own private yacht can cruise to the world-class Marina at Hideaway Beach Resort & Spa. The resort will assist in making the necessary arrangements. Start from March 1, 2019, Hideaway Beach Resort & Spa will introduce its very own exclusive seaplane service. 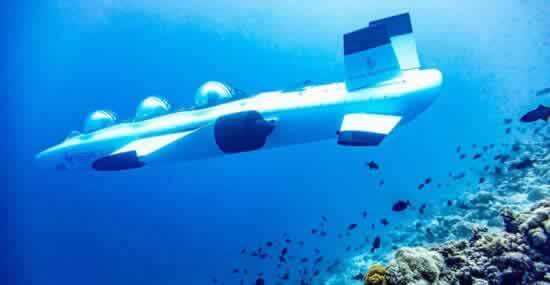 The specially-chartered seaplane from Hideaway Beach Resort & Spa will be transfered the guests from Male directly to the resort. 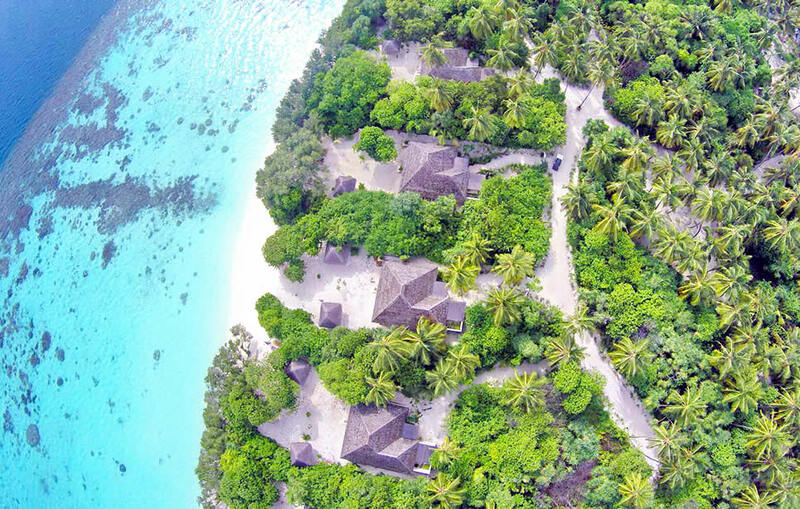 This 65-minute picture perfect flight will be a treat for the eyes gliding over turquoise waters, emerald-green lagoons and evergreen islands of the country. At the Male Airport, guests are greeted by a dedicated team and treated to an exquisite selection of drinks, canapés, pastries and free Wi-Fi in the Hideaway VIP Lounge at the Trans Maldivian Airways Seaplane Terminal. The flights will be operated by Trans Maldivian Airline and the offer will be effective from March 1st for all visitors to the Hideaway Beach Resort. Thanks to this new charter flight, guests can now save themselves a flight to Hanimaadhoo and speed boat transfers. The island is unique in its reefing - the reef system sits on a half of the natural channel that divides the lagoon into two separate parts, thereby forming a natural harbor for the yacht port. The beaches are unspoilt, with wonderful fine and soft sand around the island, and there are sandy bulges at each tip. Space and seclusion, what a beautiful blend. After closing for 2014 for renovation, Hideaway now comprises of 103 pristine, light and airy villas. In this luxurious rustic style there are 10 room categories, ideal for the Maldives experience with handmade coconut and teak wood furniture including the state of the art amenities. An all-suite Maldivian resort for those who demand genuine luxury and the utmost in privacy, Hideaway Beach takes a creative approach in the art of luxury living. Each roof is thatched, each wall and pillar is intentionally uneven; wooden floors, textiles - cotton in simple earth colors. The style of the each chalk white villa is designed to emulate the traditional coral-walled Maldivian home and set among coconut groves, lush vegetation and a blindingly blue lagoon. The differences between the categories are the room's size, the surrounding fence and the pool. Villas and suites are set on the beach among coconut palms and posh vegetation, or on stilts above the beautiful lagoon, providing world-class services and amenities and uncompromising privacy. At Hideaway Beach each villa has its own butler to take care of all needs. 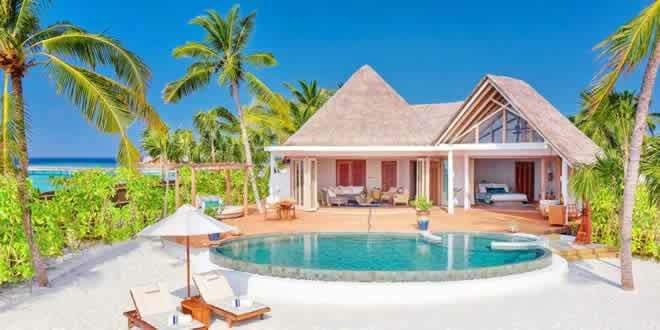 Extremely secluded, these villas of various styles (from 130m² to 1420m²) are among the largest luxury villas in the Maldives, and all beach rooms have a private stretch of sand and do not overlook any other villas. All rooms, except Sunset Beach Villas, have a private pool or jacuzzi. All villas are air-conditioned and have ceiling fans as well. Inside, you’ll find satellite TV, DVD/Blu-ray player, home theatre surround sound system, IDD telephone lines, in room safe, mini bar, and tea and Nespresso coffee making facilities. Each villa has a pair of bicycles that you’re welcome to borrow and to explore the island. Most affordable accommodation, Sunset Beach Villa (130m2) is a comfortable home away from home located on your very own private beach just a few steps away from the Indian Ocean. The spacious villa has a separate living area, next to the master bedroom. The Sunset Beach Villas there are no pools and there is a beach. The vegetation between the villas is so thick that you can sunbathe naked. Opened in November 2015, Delux Sunset Villas with Pools (190-315 m2) are the perfect compromise between price, size and location. With a separate dining and living area these villas are spacious and with a wonderful 40m2 pool, garden that can't be overseen by neighbouring villas, and beach that gives a family lots of privacy and space to play and relax. The rooms are very spacious, modern but traditional at the same time. Very cleverly designed, with direct breathtaking full views of the beach from each room and window. Bathrooms like most in maldives are open, again modern and spacious with all bvlgari amenities. VILLA FEATURES: Air-conditioning / Satellite TV / DVD and Blu-ray Player / Yamaha Home Theatre System / IDD Telephone Lines / In Room Safe / Mini Bar / Coffee & Tea making facilities with Nespresso Coffee Machine / Hair Dryer / Hot & Cold Shower / Bicycles / Bathrobes / Bath Slippers / Life Jackets / Umbrellas / Torch / 24-hrs In Villa Dining / Wine Cooler or Wine Cellar. The Beach Residence (215m2) with Plunge Pool is really seaside house – a luxury villa, the perfect escape to unwind and enjoy the decadent surroundings. A true home away from home, these beachfront residences have a plunge pool on their private beach that can't be overseen by neighbouring villas. Designed to accommodate families or groups, the villa itself comprises of a living and dining area, master bedroom and large bathroom, complete with a jacuzzi bath tub. A lockable master bedroom provides complete privacy. Its private stretch of white sand beach is accessed directly from both the airy and spacious bedroom and living room. Inside expect a huge living room with a Yamaha Home Theater, an open air bathroom with Jacuzzi and Toiletries by Bvlgari. The bed is very comfortable and the bedroom has a high ceiling. The sit out is mesmerising with the access to the beach. Each of these residences are good enough to accommodate upto 4 adults and 2 kids. With more living space, Deluxe Beach Residence with Pool (315m2) is a homely beachfront house – the perfect luxury villa setting for a romantic escape to the Maldives. With a very homely vibe, these beachfront residences have their own private lap pool and beach, set in landscaped gardens that provide full privacy. Space are plentiful as a ‘kitchenette' leads to the living room, separate bedroom and dressing room while sliding doors open on to the terrace and private beach. A lockable master bedroom provides complete privacy. The spacious bathroom comes with a jacuzzi bath tub to soak away stress and leave you feeling relaxed. This villa can be suited to accommodate families or group of friens. 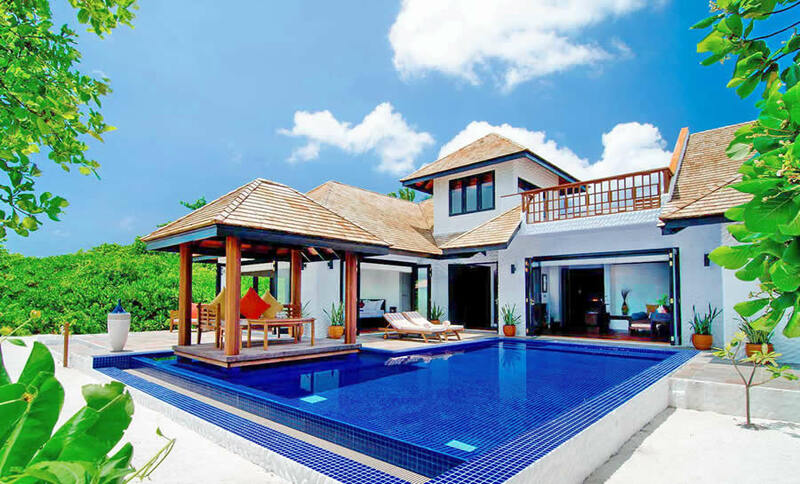 Everything your family dreamed about holiday in the Maldives is the Family Villa with Pool (440sqm). These luxurious cocoons are one-bedroom beachfront villas are perfect for families or couples who'll have a luxury of enjoying private infinity pool, a private beach, separate living and bedrooms, a massive open air bathroom and a rooftop terrace for star-gazing as well as a direct access to private beach. A separate living room area adds an area to relax to the villa. You will find this spacious beachfront retreat a perfect hideaway and the personal butler is on hand to deal with all your needs. Located near Water Sport Center, facing the sunrise, Two Bedroom Family Villas with Pool (1,200sqm) are spacious two-bedroom and beachfront villas that're offer a true holiday in style, perfect for families or group of friends who'll have a luxury of enjoying large private infinity pool, a private beach, separate living and bed rooms, and the stairs leading to roof-deck as well as direct access to private beach. A luxury villa perfect for that all-important family time, away from the outside world, these accommodation is huge and a very comfortable in every aspect. The master bedroom has its own dressing room and connected bathroom, complete with jacuzzi bathtub. The second bedroom also comes with its own en-suite bathroom. Both bedrooms have direct access to the pool and deck area. Luxury cosmetics, a mini bar with beer, wine, soft drinks and snacks, an infinity pool, 2 large bathrooms and a lounge. Included with the villa are the services of a Personal Butler who will attend to your needs and help make it a family holiday to remember. 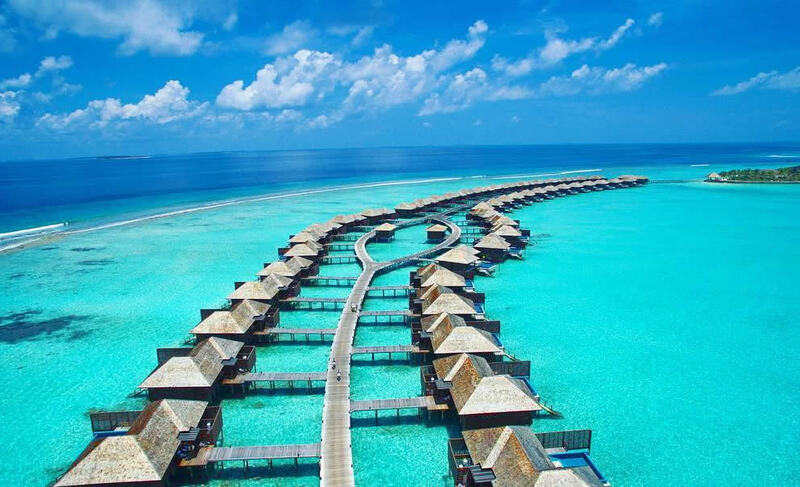 Deluxe Water Villas with Pool at Hideaway Beach Resort and Spa are located on both sides of the jetty at the island's southern tip. Half of the villas facing north while the others the south (more day sunlight). 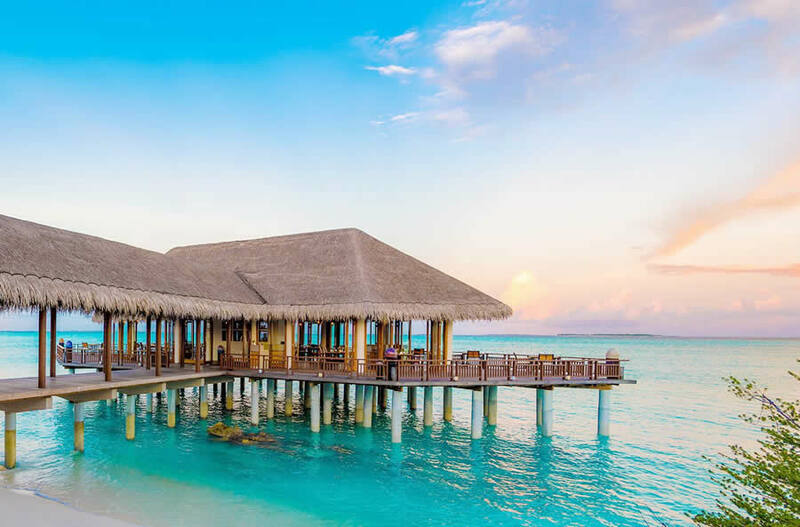 Popular with newlyweds, the Water Villas (190sqm) are set on wooden stilts over the turquoise-blue lagoon, and offer an iconic Maldivian over-water experience. The villas are huge, clean, with modern and comfortable furniture. The large con- temporary-style bedroom has floor to ceiling windows leading to the terrace where you'll find an infinity pool,sunloungers to relax. 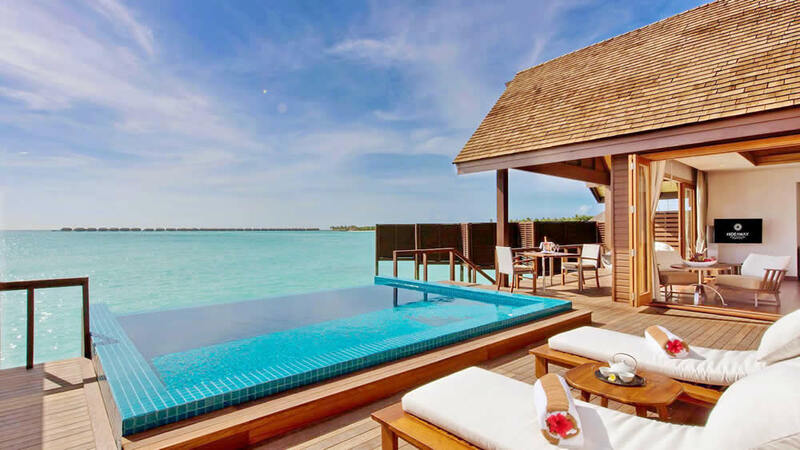 The Deluxe Water Villas with Pool are split into two sections, with the master bedroom on one side and the bathroom on the opposite site, separated by an entrance area. The rooms have all the excesrise you may need ( frige, kitel, coffee machine, hairdrayer, ....etc), they again provide you with bicyclaes, umberella, life ring, life jackets, rain coats and you can get your snorkling equipment free from the diving center. There is dining area and big round sofa for relaxing. With an unforgettable panoramic Maldivian vistas, the large outside deck with direct access to the lagoon, spans the whole length of the villa. 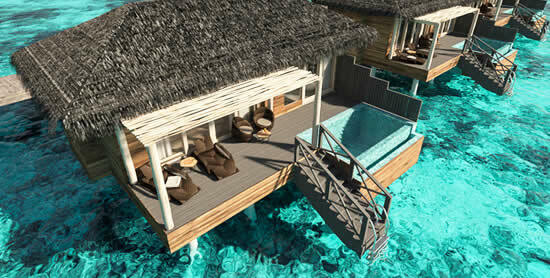 The Ocean Villas with Pool (290sqm) are set on its own crescent jetty in front of The Hideaway Spa. Facing the sunrise, these villas are an enchanting romantic haven; with exclusivity and privacy it is the perfect Maldives honeymoon hideaway. Standing on stilts above the shimmering Indian Ocean, with a glass-floored living room, a sundeck, infinity pool and ladder for direct access to the ocean, this villa choice has endless opportunities for spotting marine life and enjoying the beauty and vastness of the ocean. A separate living room provides ample opportunities for relaxation while the master bedroom offers stunning views. The bathroom includes a jacuzzi bathtub. 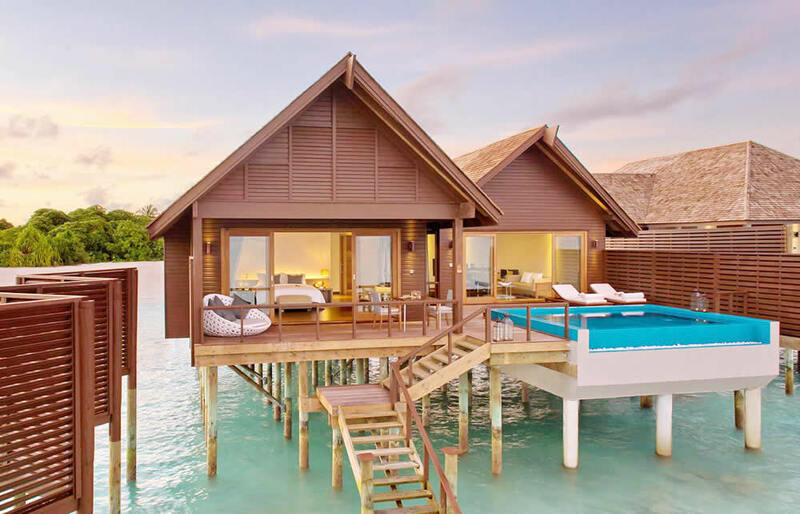 Perched on wooden stilts in the lagoon, the Two Bedroom Ocean Villas with Pool (330sqm) are an ideal foror friends or family hideaway. These double luxury villas are spaces in which to relax and unwind together, a luxurious place to create memories that will last a lifetime. There are 2 elegantly furnished bedrooms, two bathrooms and doors leading onto an extensive sun deck with a private infinity pool. 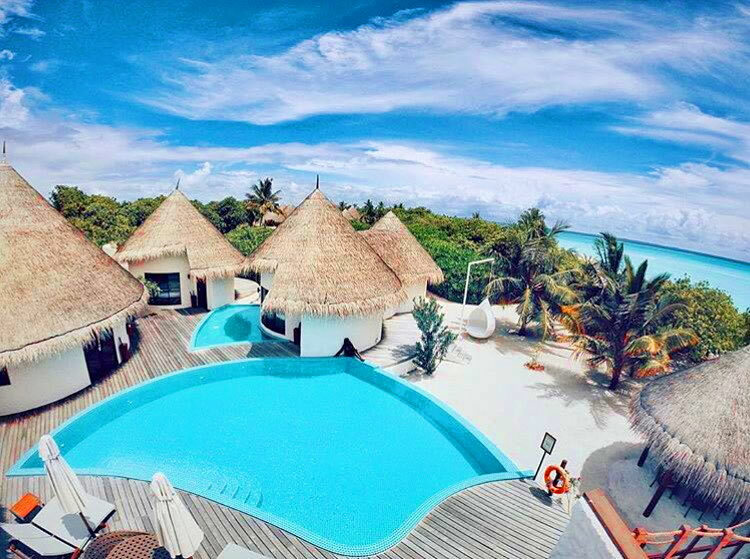 The epitome of luxury and space with a private beach location, accommodation that you can only dream of - 2 Hideaway Palaces (1,420m2) sit on the beach and enjoy 8 separate thatched-roof pavilions. Designed for large groups and families, the Palaces can accommodate guests in the 3 bedrooms that surround the private pool. All bedrooms have a private bathroom and are just a few steps from the huge pool. In villa dining options are plentiful with an indoor dining room, and a roof top terrace offering a star studded sky beneath which to dine. A posh garden offers ample opportunities to relax and enjoy the environment, and also leads to a private and secluded beach. An unforgettable culinary adventure awaits you at Hideaway Beach Resort & Spa. Guests can enjoy a variety of delicious food from modern à la carte to entertaining culinary art in Teppanyaki style and family dining, including an intimate in villa dining. In the spring of 2018, Hideaway Beach launched an all-inclusive White Platinum Plan. The resort has 4 restaurants and bars and the food served in each of them is good enough to entice your taste buds. 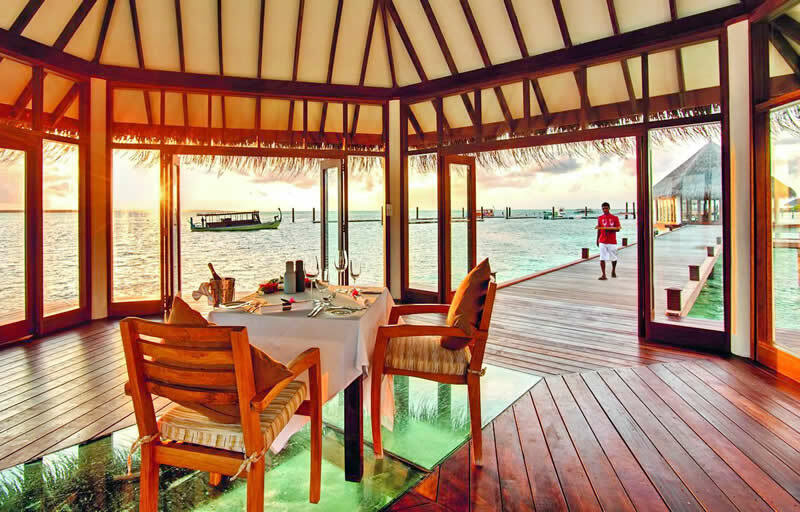 Matheefaru is the resort's main buffet restaurant open for breakfast, lunch and dinner. This sand-floored oceanfront venue offers a warm welcome to food lovers with its expansive and daily changing buffet. With the best of the live cooking stations, the expansive menu and the team of talented chefs you'd need a few days of stay to enjoy every item on the list. Fresh fruit platters, juices, pastries straight from the oven, eggs any way you like, freshly baked breads, cheeses and cold cuts of meat are just some of the delicious items on the breakfast table to choose from. Offers a wide choice of refined international cuisine and themed nights this restaurant will show you that « buffet » is not like « buffet ». While a regular buffets provide you with some different plates of vegetables, French fries and some undefinable meat, at Matheefaru you found daily changing fresh platters of warm and cold, national and international dishes, such as fresh-made sushi, fresh cut rib-eye, chocolate fountain, grilled lobster, a pasta-station where you could have your own pasta cooked right away, many different types of salads, soups, cheese and desserts ! The food is always fantastic and a huge buffet always gives plenty of choices, everytime you are pleasantly surprised by the variations included making it a new experience (including a sushi station, tandoori oven night, middle-eastern corner etc.). For wine lovers there is a wide choice of abundance and diversity from the old and new world with the island's sommelier who search of exciting wines and is constantly probing the frontiers to discover the nextbest wine. A pleasant surprise demonstrating management attention to continuously improve things, not only the food is great, but also the staff! Very, very attentive, friendly, professional, warm and discreet! You can enjoy the food outside on the deck overlooking the lagoon or indoors, where large windows offer a refreshing ocean breeze. For an utterly romantic experience we recommend booking private grilled lobster dinner in one of the two over-water dining pavilions. This experience is amazing with lobster in all angles (chopped and mixed with mango and papaya, lobster soup and the monster BBQ Lobsters themselves). A truly perfect sea food meal accompanied with perfect wine! Award winning Samsara is the Asian Fusion Restaurant. Samsara offers serene surroundings coupled with an exquisite fusion of Thai, Indian and Japanese influences. The Indian fine cuisine here and it's better than what you would find in the best of the Indian Restaurants in the Maldives. Mouthwatering food of the highest quality is prepared and cooked with theatrical proportions before your eyes – watch as they flip, juggle and cook the ingredients before bringing them together as culinary masterpieces to delight your senses. The Head Chef Shriyal can and would cook anything you could ask for with the most authentic tastes, which shows the hospitality as well as the will to serve. 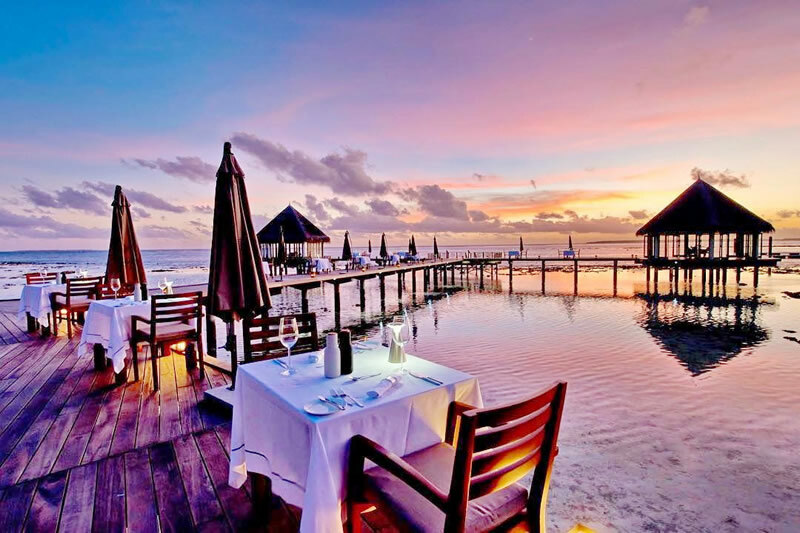 The restaurant boasts a romantic location of an open-air terrace perched on stilts above the blue lagoon. With outstanding fine dining and a teppanyaki table that will excite the taste buds, Samsara is a pleasure to be experienced more than once. A casual place to unwind by the pool, Meeru Bar & Grill is the resort's largest bar with the views to die for. Facing the sunset, the a la carte menu here is continental, including wood oven pizza and here they serve the best and succulent meat cuts of the Lava Stone grill. No matter what you order, it is delicious and on a very high culinary level! On display at the expansive bar is one of the largest whisky and fine Champagne collections in the Maldives. Here they also serve the Sheesha, which is just ok. They also have a snooker table and fish feeding here. Enjoy dinner on the deck outside whilst spotting stingrays, baby sharks and fish swimming in the ocean below.The cocktails served here are really nice and closer to night there is a disco featuring some of the best beach club DJs. Sunset Pool Cafes in a beach club style is located next to the magnificent infinity pool with sunset views. Asian and European cuisine and the taste again is amazing. They serve the best of the cocktails and boast the most spectacular infinity pool of the resort. The sweet and the fruit corner are excellent. Open for breakfast lunch and dinner, poolside a la carte dining can be enjoyed at anytime of day, and always with stunning views of the island. Cocktails is part of the holiday, you dream of sipping your favourite during sunset. Try their an excellent mixes: Mojito, Mai Tai, Bloody Mary and others. Tailor-made culinary experience: A romantic candlelit dinner under a blanket of stars, a charming picnic on a deserted Maldivian island, in villa dinning, a private barbecue on a secluded beach or an intimate seafood feast in a dining pavilion over the water – the only limit is the imagination, the resort's chefs are waiting to make gastronomic dreams a reality. No matter which of the three you choose, you will not only enjoy a perfect meal but also very friendly, attentive and professional staff who reads your wishes from your eyes. We would definitely advise upgrading to premium all inclusive as the buffet restaurant can be a little chaotic at times and the a la catre restaurants and very relaxed. The Manager for all the restaurants was very understanding and done anything to please all the guests. With its new extensive White Platinum Plan, Hideaway Beach Resort & Spa caters to the needs of all visitors, from transfers to culinary delights, fine drinks, and experiences around the resort. Please note that all activities included in the White Platinum Plan are subject to weather conditions. 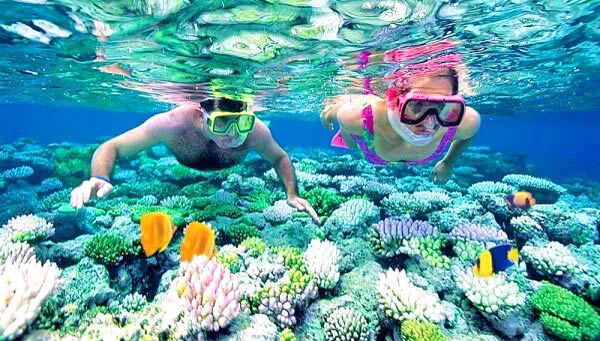 As for snorkeling, the main feature is a unique double Dhonakulhi Channel reef and about 48 dive sites nearby. The house reef channel with an average depths of 16 meters is perfect for drift or scooter diving as well good for snorkelling and exploring the reef. Snorkeling is awesome there,with a tons of fish, sharks, rays, etc and snork literally every day. The best spots are located on the west side, where drop off is not far from the beach. This is actually a narrow channel used as a shortcut by dolphins and many other pelagics, including sharks, rays and turtles, as well as occasional manta rays during the season. Unlike the other resorts there is no manta or whale shark excursion. Run by the respected German group with Kirsten, Yuko and Sia, the 5-star MERIDIS Dive Centre offers an exclusive and unique diving experience. Their skills and helpfulness are absolutely great as well as their positive spirit. Personal, professional and with abundance of excellent dive spots all around the island or a short boat trip away. The dive school also offers a range of PADI courses from Open Water Diver through Divemaster, including many PADI Specialties such as underwater photo and wreck diver. Daily there are some fun dive trips to over 25 different sites in absolutely pristine diving areas. Aquarium (great for Mantas), Dhonakulhi Channel, Heaven & Hell, Cathedral, Ihavandhoo Channel Thila and Mathi Faru are the most popular dive spots. There are also freediving courses in the dive center. The two free-diving instructors at Hideaway Beach Resort & Spa on Dhonakulhi will introduce you to specific breathing techniques, and, through the courses and workshops, will enable you to dive confidently in open water. From total beginner to advanced courses and even special snorkeling training for kids: at the Hideaway Beach everyone can learn to free-dive. Including Family Villas with Pool located in the northern part of the island (facing the sunset), the entire resort is great for families. The Family Villas have been designed with children and family living in mind – set on a private stretch of beach, each with their own pool and space in abundance. Parents and their playful children will feel very welcome and comfortable here – this combined with the idyllic setting and the services of a butler means that every moment of your happy family holiday can be enjoyed to the full. Babysitting service (on request for a fee, and the butler of course happy to help), there is a children's menu, a children's pool and a large shallow lagoon, ideal for swimming and water sports. And since all non-motorized water sports are free, the place is ideal for a happy family holidays. Young guests will love the Tender Hearts Kids Club is for children aged 3 to 12 years that is fully packed with indoor and outdoor fun activities. Open daily from 08:00 am to 08:00 pm, parents can devote their free time to themselves, while children are under the supervision of experienced professionals. The program of the club: fishing, crab run, sand castles, cooking classes, local island exploration, fishing, treasure hunt, drawing lessons, snorkeling trips and many other enthusiastic games. About the resort's family facilities, cannot ask for better. There is a free water park suitable for children and adults who are children at heart. The gym is modern and quite big with a tennis professional and nice tennis courts. Another highlight is the tennis with the new resident coach, Leonardo Tavares, an ATP pro who really knows how to teach and get kids and adults excited. Expect a new practice games every day. Designed with care and influenced by the dramatic backdrop of the Indian Ocean, the Hideaway Spa invites guests to experience total wellbeing. The sun, sand and sea provide the tranquil setting throughout the Hideaway Spa which is complemented by the internal waterways and water walls, open areas and sandy floors. The décor is complete with coconut and teak timber furnishing, sukabumi stone, java rosso tumble stone, sandstone, pink slate, onyx and silk fabrics. 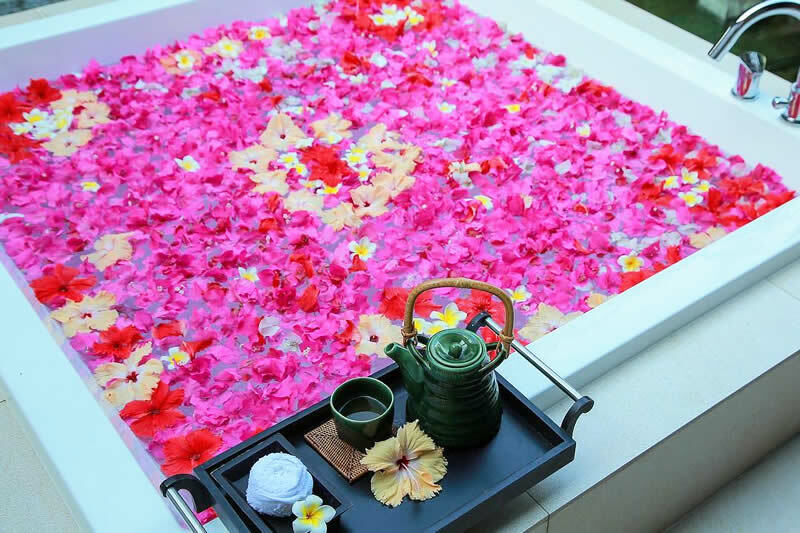 The spa menu has a wide range of personalised treatments using products by Natura Bissé – the cutting-edge, science-based wellness brand loved by celebrities – offer ultra-relaxing treatments and deliver results that really work. Both intimate and comfortable, the 12 private treatment rooms welcome you to the sound of the gentle waves surrounding Hideaway Spa. The spa's facilities also features: steam room, outdoor pavilion, manicure/pedicure, relaxation zone and retail area. 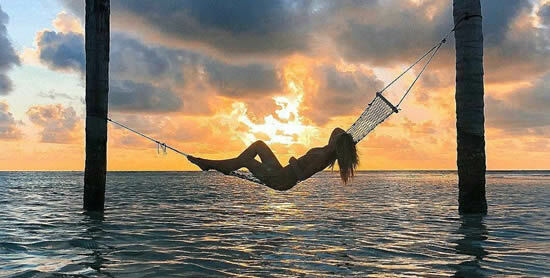 The team of experts are dedicated to ensuring the relaxation and rejuvenation of your mind, body and soul is achieved. If you are more of a yoga person, be sure to try Oxana’s Flying Yoga at the spa (and many other treatments that spa offers, including a family massage for parents with children). 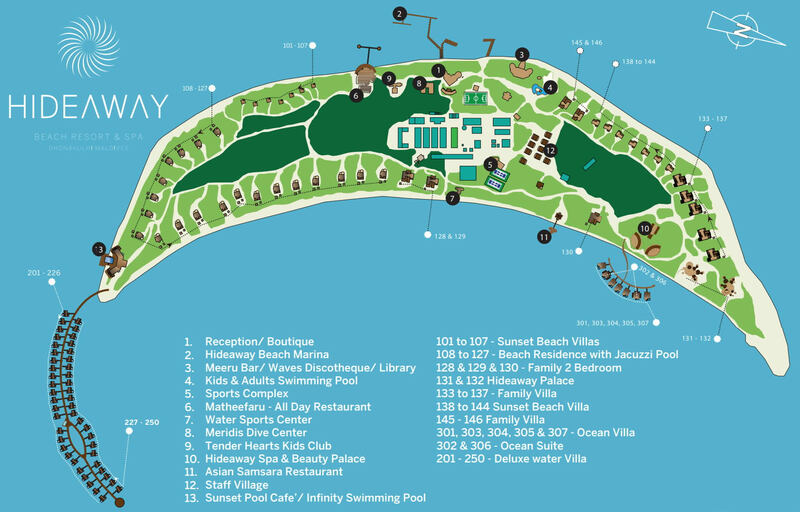 Hideaway Beach Resort has many activities on offer. The setting is tranquil, but recreation and fun are always close by. Every day, Hideaway features a range of organised and do-it-yourself activities in the gorgeous surrounds of the resort whether that be a game of volleyball, tennis, badminton, pétanque or table tennis. Whether your eager to learn the secrets of the Maldivian dishes, the professionals will be pleased to take you under their wings and reveal a few kitchen tips and secrets during a cooking class. For those who want to unwind you can do so with a session of yoga, either as a group or on your own. You can explore the underwater world and swim in the crystal clear waters or take a dip in the island's two infinity pools. You can even go game fishing, canoeing, kayaking and diving, sailing, snorkelling and windsurfing, the options are endless. None of the excursion is the usual touristic average experiences. 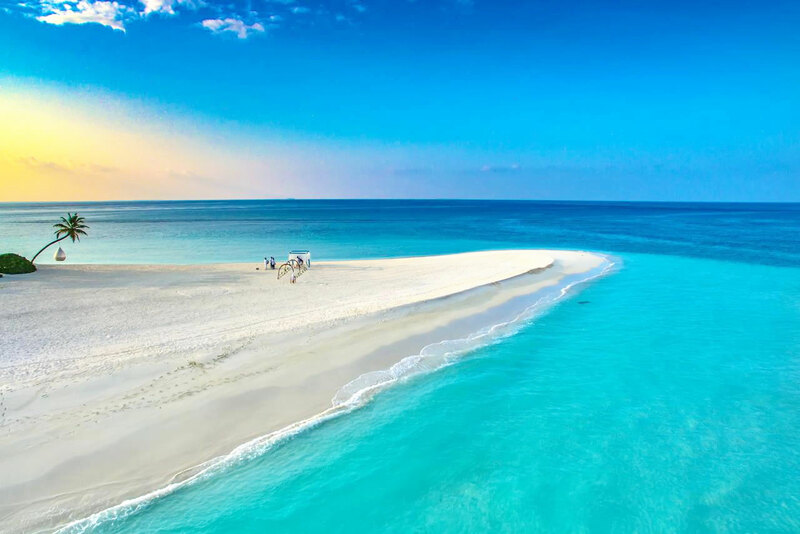 No one will return from a fishing excursion with no fish caught, no one will go out for a sunset dolphin cruise seeing no dolphins, and no one will miss any luxury from a 50m x 80m sandbank in the middle of the ocean where there are no trees but the bright white sand. Why? The answer is simple: because the staff are really happy to make the guests happy and they know how to. The hotel has sports facilities, including two swimming pools, a water sports center, a sports complex, billiards, a sauna, tennis courts, a game room, and a fitness center designed for sports and recreation. Also in the sports complex there is a tennis academy for guests wishing to enjoy their favorite sport on sunny days. WATER SPORTS available: catamaran sailing, windsurf, kite board, kayak, stand Up Paddle, jet ski and private speed boat hire. Ground-based activities include yoga, basketball, football, table tennis, and water sports include windsurfing, catamaran, water skiing, wakeboarding and kiteboarding. If you do not know where else to spend your money there is a boutique selling souvenirs, beachwear, spa cosmetics and jewelry on the island. 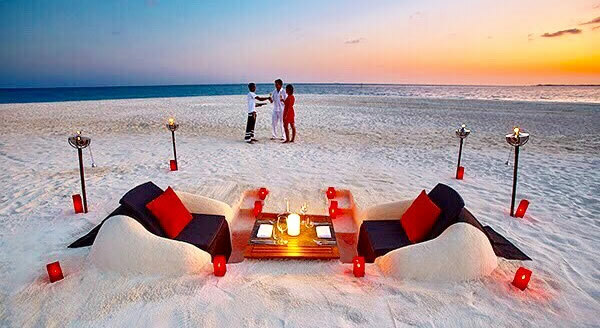 The resort also has a team for organizing weddings in the Maldives. Hideaway Beach Resort and Spa gets nearly universally excellent reviews, as you might expect for such an expensive and exclusive resort. Most guests especially appreciate the modest number of suites and villas on the boutique property, giving it a private feeling that isn't possible at one of the larger resorts in the Maldives. The personal butler service that comes with each villa also gets superb marks, as does the setting, the facilities, and the food. Those seeking a private and romantic holiday should be very happy at the Island Hideaway, particularly in the water villas. The staff. They are ambitious, attend to the very detail and spots your needs even before You acknowledge them yourself. Hideaway price is above average, and if you want to get the most out of your stay, you will spend about the same amount on site as you paid for the accomodation. The half board plan give you credite to use in the other resturant ( Sunset cafe and Samsar ), depend in your booking your credit will be. At the 2018 World Luxury Restaurant Awards, Samsara Asian Fusion restaurant at Hideaway Beach Resort and Spa has been named the best Luxury Waterside Restaurant in Indian Ocean.